These Spicy Baked Cauliflower Bites are easy, crusted with breadcrumbs, spicy sauce and addictive. Serve with celery ranch sauce below or other vegan ranch. vegan soy-free. Baked Cauliflower is always in season. Crusted with just salt and pepper, some spices, or battered and crisped up with breadcrumbs. 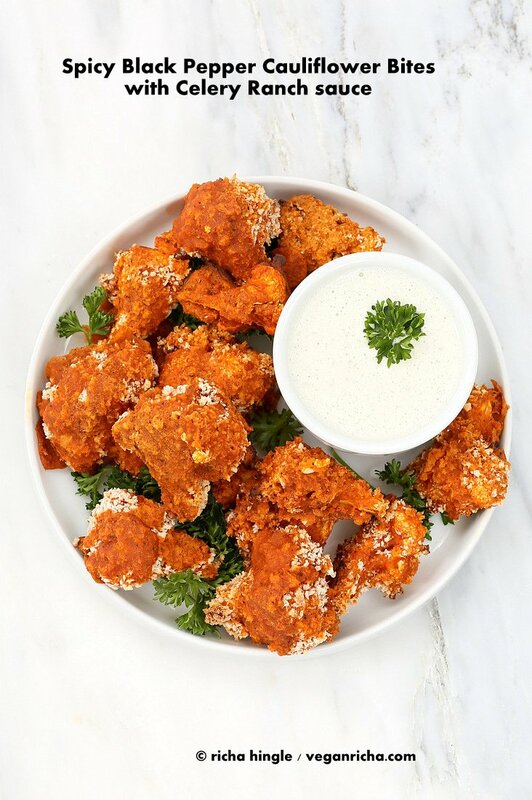 These super spicy breaded cauliflower bites will be on fire at your superbowl party. literally on fire in your mouth too! Hot sauce + black pepper + cayenne. All the heat you need! Taste the batter before using. If you don’t need a jug of cold water after tasting, you are good to go. Add more flour + water if too spicy. Serve with a cooling dip like the celery ranch on this post. Use gluten-free breadcrumbs or crushed cornflakes for the crunchy coating to make gluten-free. 2 more days to Game day! Go Seahawks! 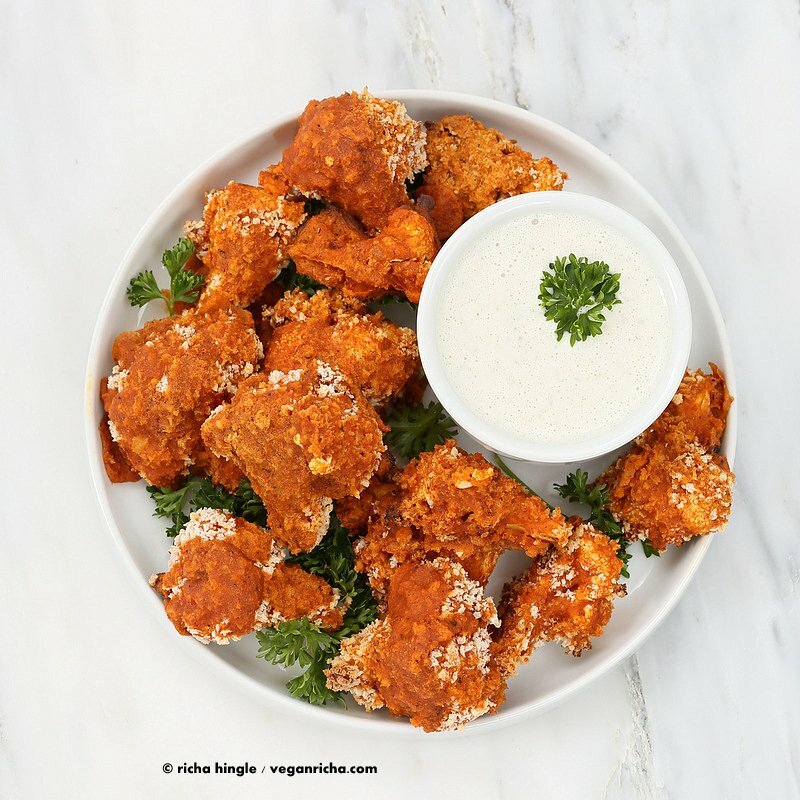 Sriracha Mango Cauliflower bites, Thai Layered Dip, Buffalo Chickpea Pizza and many more here!. You can also make Spicy Potato wedges with it. Use sliced russet potatoes instead of cauliflower. 1 to 2 tsp ranch seasoning Or use equal amounts of dried parsley, dill, thyme, garlic powder and onion powder. In a bowl, mix everything except cauliflower for the batter. if the batter is too thin, add more flour or starch. In another shallow bowl, mix everything under breadcrumb coating. Drizzle any remaining batter on the cauliflower. Spray oil. Bake at pre-heated 425 degrees F / 220ºc for 25 minutes or until a toothpick goes through the cauliflower easily. Serve warm with dip. Blend everything except celery seeds. Taste and adjust salt and flavor. Add celery seeds and blend for a few seconds. Chill and serve. when you say coconut milk do you mean the kind in the can, or carton? canned. full fat is better. Richa, you are KILLING me with these. That crust on the cauliflower looks amaaaaazing. This will officially be the second year in a row that I make multiple of your recipes on game day. I might even make 2+ kinds of cauli wings. It’s pretty much a tradition at this point! you’re right, lady, roasted cauliflower is always in season. this looks freakin amazing. 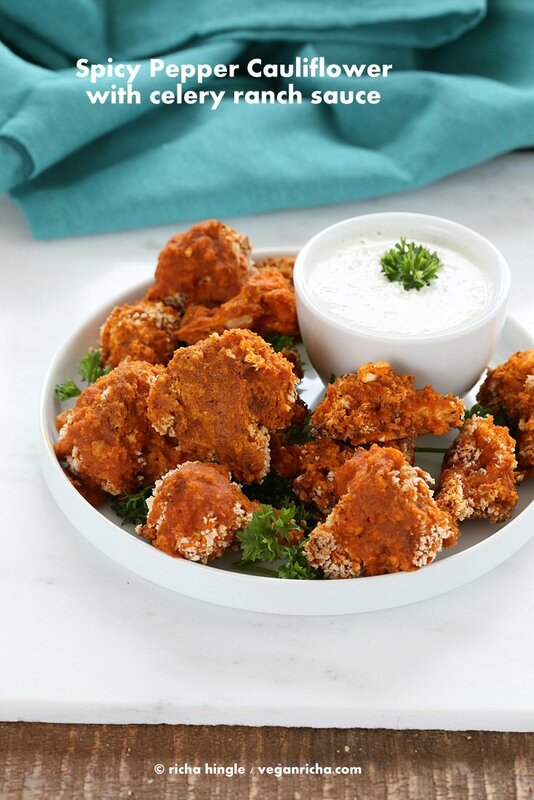 These cauliflower bites look amazing Richa! I don’t normally like cauliflower but I imagine them dipped in all of this sauce would be incredible! YUM. 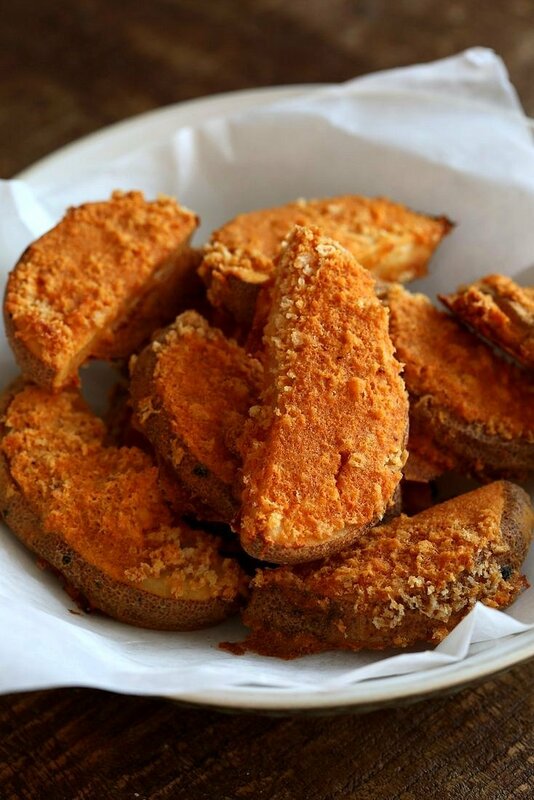 The spicy potato wedges look insane too…just beautiful. What kind of breadcrumbs did you use? Panko? I just want to make sure they come out as crispy as yours look. I’ve tried this a couple times, using other recipes, but they came out soggy. These look great! Looks great, and we loved the mango ones. If you need gluten-free, would you substitute chickpea powder or something like ground almonds? Any advice is appreciated. chickpea flour + a little starch would work. or rice flour + starch. All I can say is that we made these last Bites night and they were amazing – the marinade batter was so tasty – we made sure ours was just a little spicy – but overall the flavour combination with the cauliflower is perfect – we poured the extra batter over the cauliflower pieces and it went all crunchy in the oven – like a crisp – and you could taste the coconut milk. The vegan ranch dressing – so good – I live in Croatia where they love to eat that horrible shop bought mayonnaise from a jar – they put it on everything and I cannot eat it – you could use this ranch dressing on your sandwich as a mayonnaise substitute it is that good!! I cant wait to read your new cookbook!! We had these tonight for dinner, and everyone thought they were amazing! My younger son (who declared beforehand that he didn’t like cauliflower) gave them 5 stars, deciding that he likes cauliflower after all… as long as he gets to eat it prepared like this. My husband called them “something truly special,” thanking me for a great dinner, and my teenage son went back for seconds. We didn’t have coconut milk on hand, so I substituted soy milk, and I used tofu instead of cashews in the ranch. So good! Thanks for another fantastic recipe. Do you think this would be ok if I used frozen cauliflower and let it thaw out first? sure. check earlier during baking if its done. Hi! I just made these, and they turned out well. They were a little salty for my taste (I think because of salty hot sauce+ adding salt) and needed extra bake time to crisp up but totally delish. 😀 Thanks for another recipe! Very tasty. I was craving something junky and these hit the spot. Made half with cauliflower and the other half with zucchini. Delish. I was only making them for me so I baked half and froze the other breaded but uncooked half. My plan for “fast food” on another night. Hi. I made these yesterday and wow, just wow! These are incredibly delicious. Can’t wait to try more. I plan on buying your book very soon!! Thanks for being so creative and inspiring people like me to cook more! These are in the oven, I can’t wait! I would like to make these this weekend. They look great! Did you use panko breadcrumbs? I made this today and it came out amazing!! ???? Thank you so much! Eager to try the cauliflower bites …..can find all spices but what is Evoo. ?Also what type of shop would stock it in U K ? extra virgin olive oil. You can use any other oil. Thank you for this recipe. They were the most amazing bites I have had for a long time. We had friends for dinner and everyone loved these and the dip. None of us could really comprehend how good they were. Brough smiles and joy! Have a lovely day Richa! So good! I could barely wait until they cooled off! I made this for my co-op of 56 people along with your Turmeric Lemon Rice and the recipe for BBQ Tofu that you shared. This dish packed a little too much heat for my housemates, but the batter was extremely tasty otherwise. Pairing the cauliflower bites with ranch eased some of the kick. The BBQ tofu and lemon rice were consumed within minutes. Thats awesome! Yes these can get hot for some. Adjust the cayenne and black pepper and paprika. Paprika can be mild to hot. Is it OK that the Ranch sauce is not cooked – ie using the flour ??? THANKS – would love to know this!!! yes, it is ok. people eat raw cookie dough with all flour uncooked. you can omit the flour and add a tbsp more cashews. can you clarify how I would grind the cashews for the ranch sauce please? As well, do the cashews need to be soaked before hand? no they are dry. You put them in a blender 1 tbsp of starch and blend until they become a fine meal and use. very much appreciate you responding back! Delicious! I’ve made these twice now and they are so so good. I made them for a party and everyone loved them, carnivore and vegan alike! Thanks so much for your amazing recipes, Richa! !